My eldest asked me a couple of nights ago if I could replicate some chicken that ALL my children adore at a local Chinese restaurant. One that we seldom go to anymore because it is just too stinkin expensive now that my kids are being considered 'adults' when we go out to eat. I knew exactly which chicken she was talking about. I had the sauce in my mind... and I knew it was pan fried pieces so I went to work. I had Cameo cut the chicken up into small chunks. We then dredged the chunks first into arrowroot powder and then into egg. Have a couple of inches of oil in a pan heating, you want this hot enough to fry. We fried the pieces of coated chicken and then laid them in a baking dish. Once you have all your pieces fried, btw... we used about 4-5 breasts cut up for my family of 6. Grab a medium bowl and whisk up some sauce. Whisk this together and pour over your finished fried chicken bites. 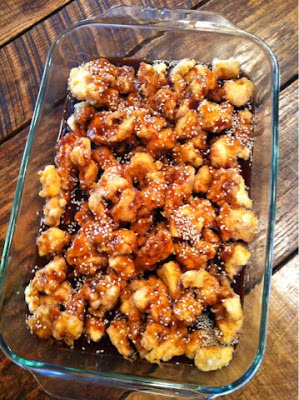 Sprinkle with sesame seeds and bake for about 20-30 minutes. You may need to stir once while baking. Your chicken is already done from the frying, this is just to coat and heat everything through. Serve with fried rice or as a dear friend suggested, slivered cabbage! YUM! 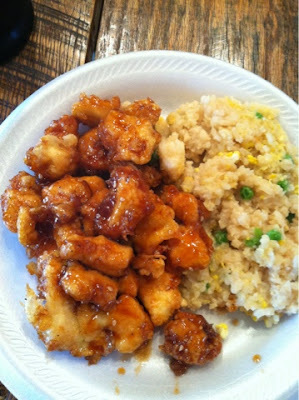 I love the honey chicken at the Chinese place about an hour from me, but theirs doesn't have a coating on the chicken :( I will have to try this recipe. What degree do you bake this dish?